What did people eat? What did they wear? What was the significance of the location of Gethsemane? How did the geography of Palestine and the customs of the Jewish people influence Jesus? Why was Golgotha called the place of the skull? With Scripture Footnotes as your guide, you will be able to read the four Gospels and all of Scripture like never before! 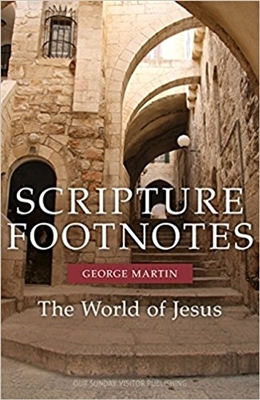 With new understanding and deeper insight, Scripture Footnotes will take you closer than ever to the life and times of Christ. George Martin is the founding editor of God s Word Today magazine. He has written numerous articles on Scripture as well as the books Reading God s Word Today, Bringing the Gospel of Mark to Life, Bringing the Gospel of Matthew to Life, Bringing the Gospel of Luke to Life, and Bringing the Gospel of John to Life, which won first place in Scripture in the Association of Catholic Publishers 2017 Excellence in Publishing Awards.